During 2018, we have seen an unpredictable geopolitical landscape affecting global markets and 2019 is likely to see a continuation of this theme, with positive growth signals tempered by continuing political uncertainty across the US and Europe. Join us for our upcoming Investment Outlook 2019 webinar, in which we will examine the new challenges and opportunities that we expect investors to face in 2019. Attendees will be eligible for 50 minutes of structured CPD credits. 2019/20 is poised to be a relatively good year for Japanese risk assets, with a focus on Japan small-cap equities in particular. The deep-value of attractive valuations can potentially be unlocked by the combination of positive domestic growth surprises, rising M&A activity, as well as stable monetary and fiscal policy support. Against a backdrop of global uncertainty, Japanese domestic small cap stocks appear a great place to hide for outperformance. The electric vehicle market is changing the automotive landscape. Sales of electric vehicles are growing exponentially as innovation in battery technology drives the total cost of owning an electric vehicle lower. In this webinar, we will explore developments in the battery technology landscape and how changing demand may affect the prices of commodities, such as nickel. In 2018, the Exchange Traded Product (ETP) industry continues to enjoy rapid expansion. The industry has grown, not only in terms of size, but also choice with a growing variety of product-types and exposures now available. 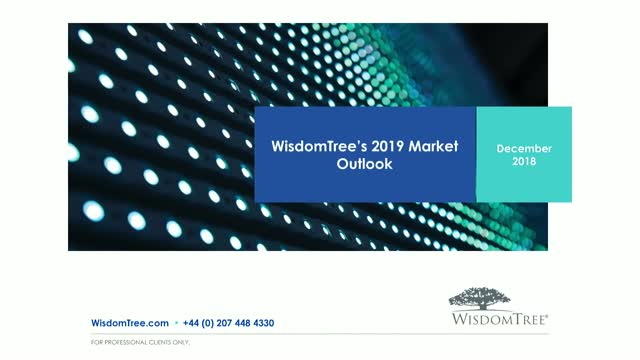 In this webinar Jason Guthrie, Head of Capital Markets at WisdomTree in Europe will examine the evolving ETP industry taking a look at how advisors and investors can navigate this changing landscape. Attendees at this webinar will qualify for 45 minutes structured CPD credits. Broad commodities have seen a strong start in 2018 so far with investor sentiment improving. Is this renewed interest a sign that commodities could climb further or is there reason to be cautious? • Industrial metals - potential star performer for 2018? • What factors may affect the gold price in 2018? Live webinars & videos covering developments across global markets.